Monday Morning Man: Lucien Laviscount! Handsome British actor Lucien Laviscount is one of the stars of the hit series Scream Queens on Fox. At 24, his star is certainly on the rise. He has also done guest spots on Episodes, Supernatural, and Skins. He looks like a young version of Shemar Moore. 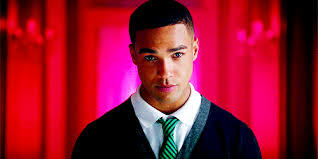 Lucien is such a doll face, he is simply perfection. Perfection is the word for it. His time would never run out. Very hot Man. First time seeing this young handsome face after watching Honey Trap, very interesting character. Loved the movie, fell head over heels with Troy, brings back memories from my childhood. Does he live here in the United States of America right now? Would love to visit London one day….